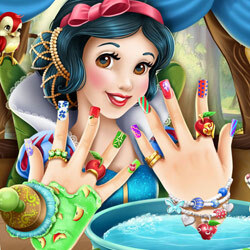 Description: The sweet and gentle Snow White is going to the nails spa for the very first time and she needs your help with a new manicure. Join her in a professional salon, apply the relaxing hand treatment, repair the nails and get ready to create beautiful nail art. Finish your masterpiece with cute bracelets and rings to add more elegance to her style.